If Trent Phillips can duplicate his success playing Junior golf on the college level, he may not be there for long. Brian, Beth and Zach Phillips helped celebrate Trent’s signing with Georgia. 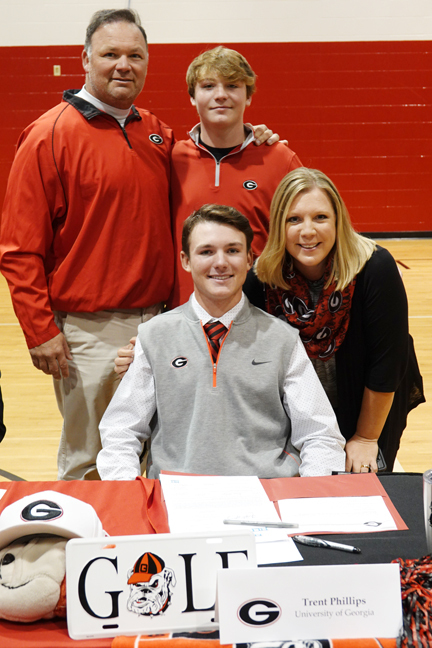 The Boiling Springs senior has signed to play college golf at Georgia. He will join his older brother Trevor on the Bulldog golf team next year. “I’ve been ready for this, its about time,” said Phillips. “My ultimate goal is to make it to the PGA Tour, but that is everybody’s goal, so you have to work harder,” he said. The two-time South Carolina Junior Player of the Year considered the possibility of enrolling at Georgia this spring. Phillips is an outstanding student and had already finished his high school work. “I was committed to doing it, but then it just didn’t feel right so I decided to finish the year here,” he said. Staying in high school through the end of the year sets up the possibility of helping Boiling Springs to a fifth straight AAAAA South Carolina championship. 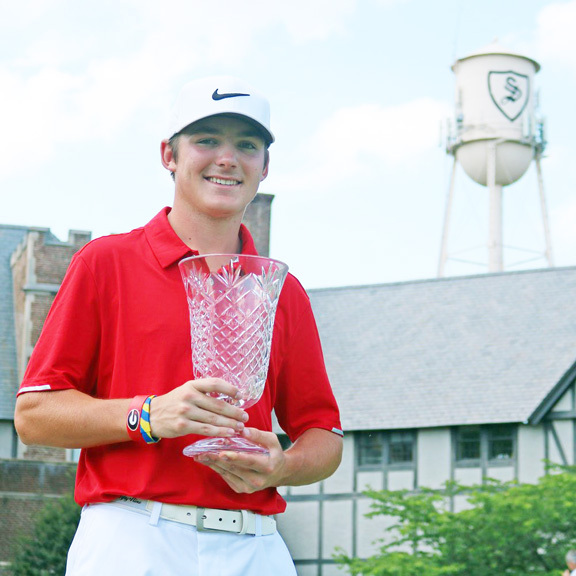 Trent Phillips won his first AJGA title at the Haas Family Invitational played at Sedgefield in Greensboro. It also gives the third ranked AJGA junior the opportunity to work on a part of his game he thinks needs to improve to play at the next level. “Driving the ball, I think if I can get the ball in the fairway I can play with anybody on any level from there. I just need to keep the ball in the fairway,” said Phillips. In the past calendar year Phillips has won 12 of the 23 tournaments he has entered. He won his third South Carolina AAAAA individual high school championship and his second SCGA Junior championship. His wins this year include a victory at the Beth Daniel Junior Azalea, The Southern Cross and the Dustin Johnson World Junior Championship. 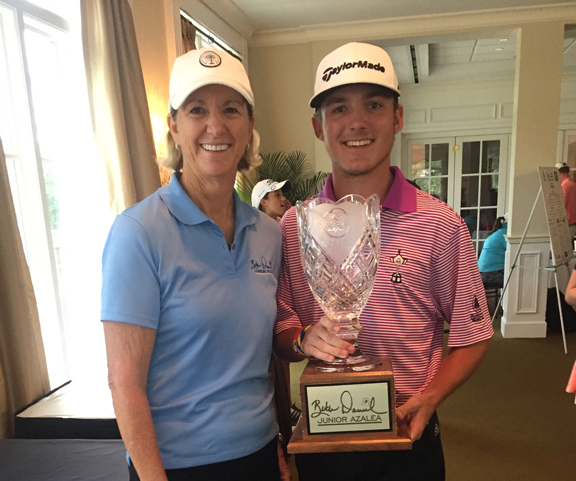 Trent Phillips won another SCJGA Major championship with his victory in the Beth Daniel Junior Azalea. As a high school junior he won the Bobby Chapman Junior and stepped up a level to win the prestigious Palmetto Amateur at the Palmetto Golf Club in Aiken. 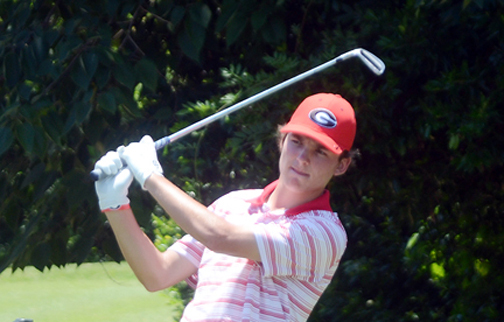 On the national stage Phillips earned a place on the first Junior President’s Cup team. He claimed an AJGA victory at the Haas Family Invitational. He won the event by beating Eugene Chung, who was the top rated junior at the time, in a playoff. He finished third at the PGA Junior Boys championship and thirteenth at the Junior Heritage. Phillips expects to make an immediate contribution to the Bulldog golf team. He knows it will be harder to win on the college level than it has been in Junior golf. Phillips is ranked as the third best junior in the latest AJGA rankings. “My goal is to go there, get better and move up the World Amateur Ranking. Ultimately, I want to turn pro before all four years are up and I don’t think I can do that without winning some tournaments so that is definitely what I need to do,” concluded Phillips.